It's MidWeek Munchies Time! Keep scrolling to check out more and participate! I will most likely be doing a few MWM posts from now to next Tuesday! This past weekend I grabbed some lettuce, baby spinach, cherry tomatoes, a sweet onion, carrots! Not overly exciting but still MWM! I finally received one of my shipments which is pictured above. 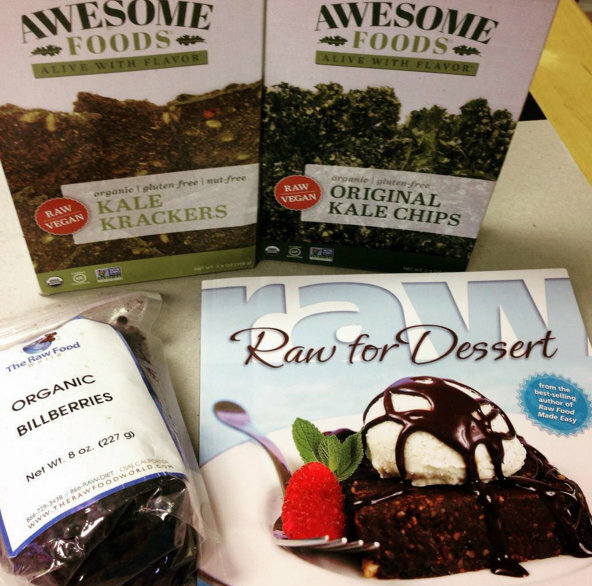 Kale Krackers and Kale Chips from Awesome Foods, Organic Bilberries from The Raw Food World, and a new raw foods UNcookbook focused on desserts. I also received a shipment from Indigo Herbs from the UK that I'm super excited about and will be blogging about VERY soon! Here are the things I received! Organic Cacao, Organic Pea Protein Powder, Organic Chia Seed Protein Powder, and 2 nut butters...Raw Almond and Raw Hemp!!! YAY! All 5 products are VEGAN! Love Force is a brand that I am totally loving over the last few years and haven't gotten anything from in a while but will be placing an order for some of the energy bars and maybe even some of the Kale Chips! 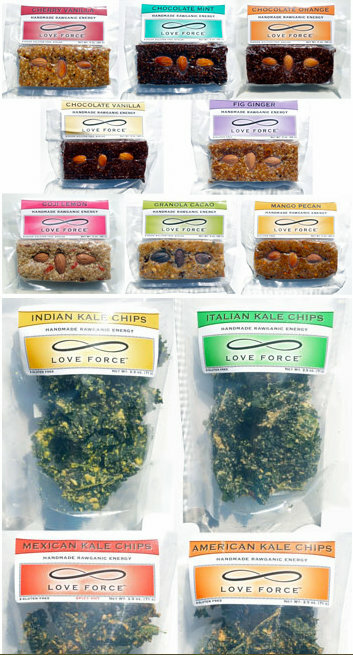 I LOVE LOVE LOVE their Kale Chip flavors! 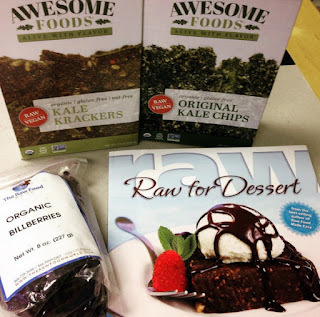 The Raw Vegan Energy Bars I have tried of theirs, too, are pretty amazing, as well! It's YOUR TURN! Link up friends!!! SORRY FOLKS! Having a little problem with the LINKY. If you are participating let me know in comments and I will let you know when this week's coding is UP! Fun mail for sure! I'm curious about the hempseed butter, can't wait for your post about it! I've tried another Hempseed Butter and it was pretty good! This one looks creamier than the one I had previously! What an amazing haul! I love using Organic Cacao, Organic Pea Protein Powder, Organic Chia Seed Protein Powder and Raw Almond and Raw Hemp nut butters!!! I use them regularly! Great finds, yum on everything! I should participate this week because hubby surprised me with a bunch of raw snacks for a business trip! I'll post about them soon. :-) Looking forward to the review on the hemp butter too! Oh! Can't wait to hear about those snacks! 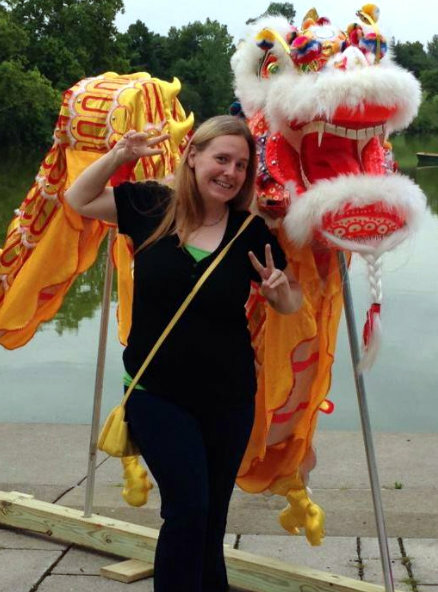 And the trip! Just got a note back from you and responded! Thanks Girl! Hemp seed butter??? I have never tried that! But I LOVE hemp seeds so I bet it's crazy delicious. Have you tried it yet? How do you use it? 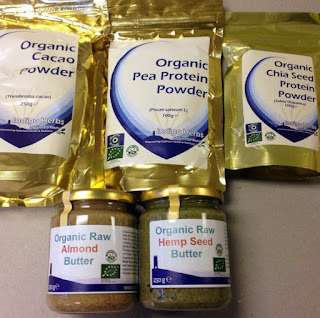 I haven't tried the hemp seed butter yet but excited! I was thinking about smoothies or sauce bases!